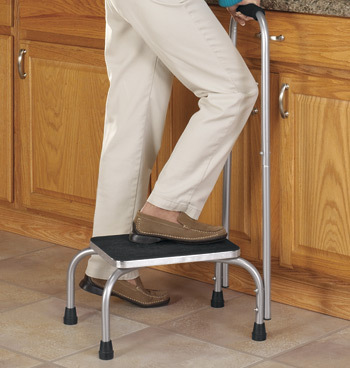 This step stool with handle lets you easily reach cupboards, lightbulbs and more! 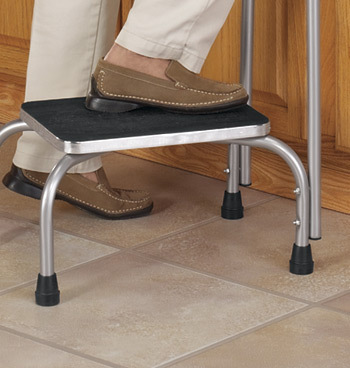 This step stool’s tall, foam-gripped handle helps you balance when stepping and standing on its 14 1/4"Lx10"W rubberized platform. Bowed legs and non-skid feet enhance stability. 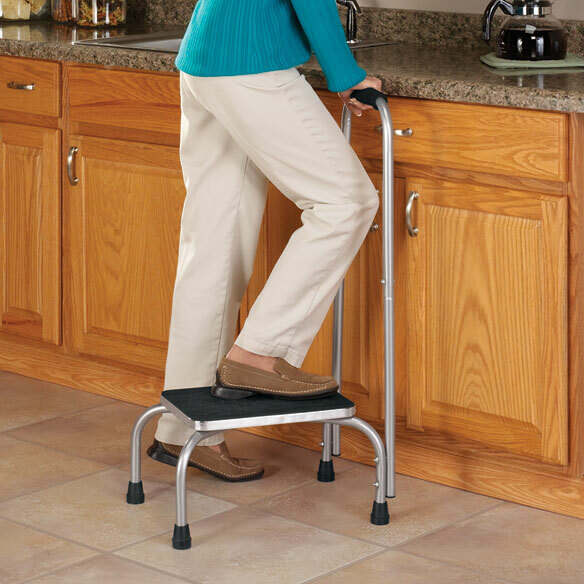 Step stool with handrail supports up to 220 lbs. Chrome-plated steel. Simple assembly required. 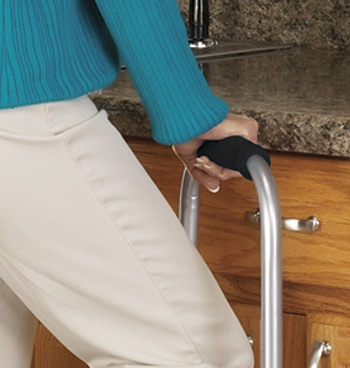 16"Lx12"Wx34"H.
This product is the only stepstool my mother feels comfortable using anymore since it provides the handle to stabilize yourself and a large, steady foot surface. We have one in our utility room, workshop, garage, Mom's Bedroom and office. I recently purchased the step-up stool with safety bar and I am so glad I made this purchase. I am over 60 with mobility issues and since I do live alone safety is a daily concern. Now that I have this step-up stool to aid me in reaching higher shelving areas in my kitchen,I have a stronger sense of confidence in being able to successfully reach the higher shelving units. Thank-you Easy Comforts,for making this purchase possible. My mother recently got a new mattress set. The mattress was taller than her old one. She need a step stool to get into bed. This stool works great. It has the hand rail so she can steady herself getting into bed. I purchased this for my 90-year old parents; after 3 attempts at assembly (stopped each time out of frustration), I give up. It is utterly impossible to attach the handle to the legs of the base. Guess I just purchased an expensive step-stool. The one I bought is still sitting unused as I am waiting for someone to visit that can assemble it for me.The concept is great and I am sure I will like it once I can use it. We couldn't put the stability handle on and still maintain the stool stability. Having surgery and bed is tall. This will help me get into bed. I don't want to fall. I'm 64 years old. I have vertigo. And my Mom has one and She loves it. As a handy step exerciser & for reaching items throughout the house. I am short and it is difficult for me to turn the ceiling light and fan o. We have SUV on a truck chassis, so it is very high. Hubby is able to get out without a stool but needs assistance getting in. He is now able to drive, and he will be able to pull this stool inside the car. It will allow his to have more freedom to get around. To reach all the shelves in my kitchen and closets. To help my elderly parent. Need for people getting on and off a small massage table. safety reasons cause I,m so short and I can not get all my clothes out of the new washer and the step my hubby had made me was to small for bigger washer and with the handle on this step stool its more safety for myself. We need a step stool with a handle for patients to step up onto procedure tables at the hospital. I already have one and now I need to have another one for my kitchen. Need assistance to get into bed. I am elderly and have trouble with my knees. I am also short. This help me reach my higher cabinets and with the handle, I will feel safer doing so. My mom bed is too high, this will help her get in and out of bed. My Mother needs this to get in and out of bed. The height is low enough a handle for access into higher vehicles, I'm in a wheelchair. They had the item I needed. need the support. Very helpful. Have a person with disability in the household and this device, we feel, will greatly assist this person. You offered freemshipping after I gav my email. You did not appy that ctedit. Like the single step and stability of the handle. just what i need for a reasonable price and very accommodating customer service. My wife is only 4'10" tall and can't reach high shelves. what is height from floor of step? BEST ANSWER: Thank you for your question. The step is 9 3/8" from the floor. We hope this information will be of help to you. how tall is step ? Is the step fiberboard or metal? BEST ANSWER: Thank you for your question. It is a chrome plated steel. We hope this information will be of help to you. The step is metal and is quite handy in the kitchen to reach the top shelves. BEST ANSWER: No, it does not fold, but I find it the most helpful item in my kitchen. I am 5 ft. short and need it to reach the second shelves in my cabinets and I drag it all ove the house sometimes to reach those "hard to reach" spaces. No, it is sturdily built but does not fold. No this step stool does not fold.